Our country is in 9th position in the international tourism world ranking, which is why so many people from all around the world decide to spend their holidays in Cancun and visit Xel-há, a unique aquatic park in Mexico! Xel-há is the perfect combination of nature and fun. Spread over 80 hectares, there are numerous activities for each and every visitor, according to their preferences. One of the aspects our visitors enjoy the most, are the different ways in which it is possible to learn about the Mayan culture that inhabited this part of Mexico, many years ago. Sea Trek: it is a hike in the depth of the Riviera Maya ocean. Equipped with helmets, you can admire your surroundings, see multicolor fish, corals, reefs and the clarity of the Mexican Caribbean Sea. 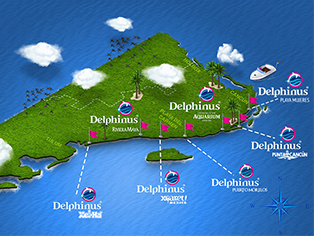 Swim with dolphins: in Xel-há, your experience of swimming with dolphins takes place in a completely natural environment. There is nothing better than being surrounded by the Mayan jungle when interacting with this marine mammal. Snorkel and diving: the translucent waters of this ocean together with the flora and fauna make a perfect setting to go diving deep into the ocean’s heart. Cenotes: cenotes are surface samples of the underground rivers that pass through the area. Some are fully protected because of the risk of extinction of some of the wildlife living there. However, there are some where you can swim and they are a feast for the eyes. Jungle bike ride: Can you imagine crossing the Mayan jungle on a dirt bike? This is possible in Xel-há, you definitely have to try it. Exploring caves: there is a Mayan Cave where you can hear the crashing of the waves and witness a show of lights and sounds that will create a unique atmosphere. In Xel-há you can visit grottoes, zip line, cross floating bridges, swim in underground rivers, cross the jungle by train, live a swimming with dolphins experience or simply enjoy a relaxing moment at the Xpá or on the beach. Now you can see why this is one of the best aquatic parks in the world. Are you ready to book a unique vacation in Cancun?